Chemical and corrosion attack on concrete surfaces in facilities in the Chemical processing, Manufacturing, even Aviation and Food & Beverage industries can be costly, creating a hazardous work environment, disrupting production or causing a shutdowns, which can lead to lost revenue. Many chemical resistant flooring solutions can be installed, cured and ready for use with quick turnaround, eliminating costly down time. 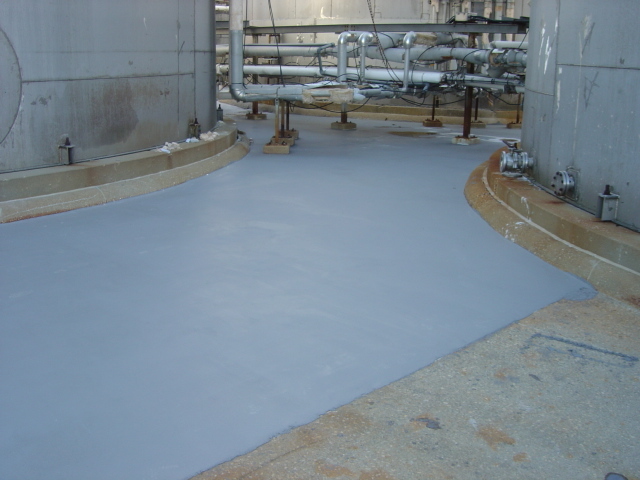 Installations may include flooring, cove bases, containment walls, room walls, sumps, pits, curbs, foundation pads and any other area where chemical resistant surfaces are required. Typically, chemical resistant flooring is lightweight, waterproof, non-porous, seamless and sanitary, resistant to not only to chemicals, solvents, oils, acids, alkalis and salts, but to abrasion, shock, slips and falls, mildew and pests such as insects and animals. Surface Solutions provides expert consultation and installation, and a full line of chemical resistant flooring solutions in addition to other industrial flooring systems. We are committed to 100% customer satisfaction on every project.